Hanabi was a very generous gift I received for Christmas 2012 by none other than SamNzed from BGG. I had heard of it but had let it slip out of my radar as it was difficult to get a copy back then and I already had quite a few co-operative games in my collection. So how does it hold up ? Well, let me tell you ! I normally don’t describe game rules in full but Hanabi’s rules are really simple and easily explained. Each player has a certain number of cards in his/her hand ( dependent on the player count ). The trick in Hanabi is that the cards in your hand are facing away from you, so that everyone else can see your cards except yourself. Likewise you may see everyone else’s cards and each player plays blind essentially. When a player gives a clue to another player, the clue must be full and must either point out a color or a number. Example, “you have 2 blue cards, here and here” or “you have 3 threes, here here and here”. Giving a clue which says “you have no blue cards” is also allowed. When a player plays a card from their hand, they merely declare that they are playing it. The player does not need to know exactly what card he/she is playing ( but that would be good to know of course ). And when a player discards a card, they simply declare they are discarding and pick a card to discard. This helps the players to obtain another clue token as during the game, the players only have 8 in total. The objective of the game is to play the cards in perfect ascending sequence so that you form 5 stacks of fireworks ( numbered 1 to 5 ). The five stacks are of the 5 different colors of the game. The game ends when the draw deck runs out, or when the players collectively make 3 incorrect card plays ( playing a color or number card that does not follow the ascending sequence ). If the players end the game by making 3 incorrect plays, they lose collectively. If the draw deck runs out, they tally their points based on the highest number in each stack. Hanabi Components. Small on Stuff, Big on Fun ! Hanabi didn’t sit well with me the first time I played it. I’m not sure if it was because of the group I had played it with ( all new to games except myself ), or if it was merely due to it being the first play of the game. We ended up with a terrible score of something like, 15 points ? and after that we packed it up and hit the bed. I didn’t think much of it after that and had a big hurdle in making myself bring out the game to play with others. Since then I have played it 5 more times and well, let me tell you what I like and did not like before I wrap things up. I have quite a few co-operative games at home, but most of them have some really tedious and arduous set up routines. Hanabi is great because you can get it out of the box and begin playing in a minute ( if everyone knows the rules ), or in 5 mins if you had to teach the game afresh. That’s some brownie points right there. Usually in games, when you are playing blind, it’s just not very fun. But for some reason, in Hanabi, it’s pretty awesome. I think the reason is, you are able to see everyone else’s cards, and that’s enough to make you forget about your own. There’s so much you want ( or need ) the other players to do that you completely forget that you have much that they want you to do as well. 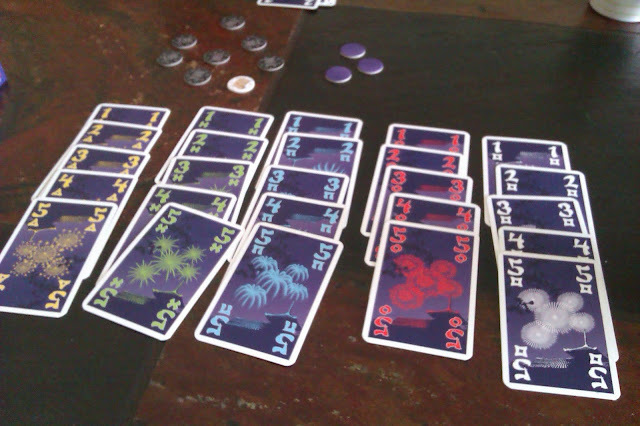 I’ve played games of Hanabi where halfway through, I still knew squat about my cards, and I wasn’t even sweating it. There are many decisions to be made in Hanabi ( should I tell him about his 5s ? should I make known the useless cards she is holding ? ) and everyone of them seem important. Because there is only one 5 of each color, you feel like you have to tell someone before its too late, but you also want to keep the game moving as there is a clock ticking to the end, and you only have so many ( real meaning: so little ) clue tokens to expend. This makes the game very tense near the end and I like tension in my games. I have played many co-operative games, but Hanabi is up there when it boils down to the feeling of working together, winning together, and celebrating a high level victory. It’s because you play blind for the entirety of the game, which is why after the end of it, you know that the success was a team effort. You never really had any firm control on the outcome and thus the victory is much sweeter. 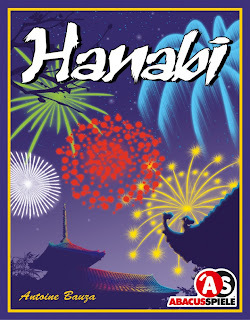 There were more cheers in Hanabi after a success than I have had for many other co-operative games. I’ve taught Hanabi to 4 different groups so far, and apart from the first ever play of it, every other group has picked it up well and has grown to like it quite a bit. Even if they were new to the game ( or new to games ), they seemed like old-hands during the game itself. Each one taking up their roles, getting attached to every player’s turn and move. From the mouths of my friends themselves, they will say the game is “Elegant”. 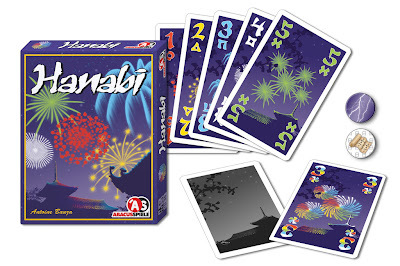 Hanabi is probably the hardest game to avoid subtle cheating among the players. 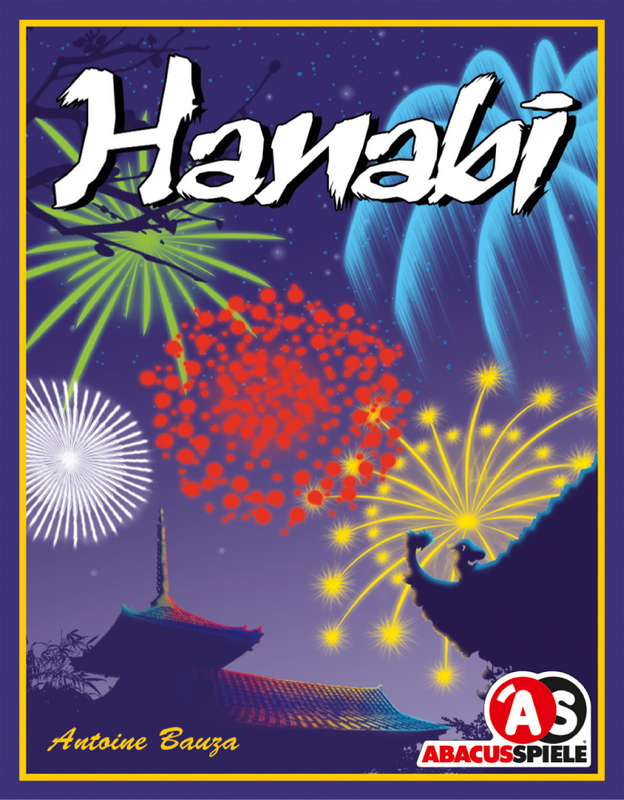 I typically prefer to play the game rule for rule and to avoid any grey areas in the rules, but the way Hanabi is structured, it is extremely difficult. There are often times when a player says “I am discarding”, and when he/she reaches for the card they want to discard, the other players tend to either laugh, or let out some form of facial expression that is a hint that the player is making a poor choice. Likewise when giving out clues, some players tend to highlight certain cards or tend to pull out a card higher than the rest for emphasis. These really sour me on the game as I like things to be done in a fair and right manner. A victory under such conditions isn’t really worth much in my books. One rule that people forget is that on a player’s turn, only that player may speak, but in most games I have played, the table is always an open discussion. I think I am ok with that as it is after all a co-operative game. As long as no vital hints are given or anyone explicit states what they know or don’t know, then that’s fine with me. But I do hope to play the game the “proper” way in the future. Hanabi is a great game on many levels. It has found a way back from an initial poor first impression and it looks like its here to stay for the near future. Already my friends are requesting to play it on our next game night and I have no reason to say no. It plays fast, it plays well with all the range of players ( have not tried the 2 player though ), and most importantly, its fun. Yes it may bring the sneaky cheat out in us every once in awhile, but when I see my friends laughing and having fun, I can’t really complain about it. At the end of the day, that’s why we all play the games we do, for fun and a great time with great company. Agree on the cheating ...... sometime I felt it was so blatant!